November 25th, 2007: The deed is done, and we are no longer residents of Greenwater Lake Provincial Park. We went there Friday, met with Kelly and Brenda Rusteika, the new owners, and turned over the keys. We were able to introduce them to Brian Shuya, who delivers water, wood, birdseed and advice on plants and birds; also to Lenard Teale, who looks after septic pump outs, backhoe and bobcat work, and to Darren Teale, who runs the Cove. Then, to Joe Ottenbreit, Park Supervisor, and in Porcupine Plain to Gerald Johnston and Myrna Smith of Johnston Agencies. The Rusteikas would have loved to stay a few days, but they have three sons, at least one of whom plays hockey, so are slaves to their schedules. They are really looking forward to spending the Christmas and New Years holidays at the Park. Besides hunting and fishing, they love snowmobiling. We left them two pairs of cross-country skis so maybe they will take up that sport as well. Thursday evening, we stopped in Tisdale and had supper with some members of the Parkland Photography Club. The weather had scared them off when our potluck supper was held at Greenwater, but they wanted to say goodbye. It was a good time – they are great friends. Our son, Mike, got the club going in 1986, and we joined a year or two later. Jenny Fritshaw and Mary Wright were charter members and valuable contributors; Darlene McCullough joined shortly after, likely about the same time as we did, and has been secretary-treasurer and Club Whip ever since. Alan Caithcart, Anne McIntosh and Glenn Galloway are more recent members and great contributors. I guess that is the secret to the success of our little Club – the members contribute. What a great bunch of people to be associated with! Friday morning, we went to the Cove for coffee. There was a good turnout and we had another good time. Good thing Jack wasn’t there – he would have been shocked to see us still around and might have said something inappropriate. Driving to Greenwater Thursday, and back Friday, we had lots of time to listen to the radio. By the time we got home, we were sick of hearing about the Grey Cup. A solid week hearing of nothing but Grey Cup parties is a bit much. We watched the game today; aside from the fact that Saskatchewan won, it wasn’t a particularly exciting game with few great plays, but the fans who attended wouldn’t agree with me. I thought it looked as if neither team was able to really get any momentum going, but maybe winning with yards and field goals is good football. One day, I walked to the Co-op store, bought a paper and a cup of coffee, and settled in to read it. Then I realised as I looked around that reading a paper while having coffee is like flying a banner saying: “Do not disturb.” That is not what I intended – I want to be disturbed. I want to be part of a coffee group but so far haven’t seen one. Next time I see someone sitting alone with a cup of coffee, I am going to sit down at his table and try to strike up a conversation. If he wants to be alone, he will find a way to let me know. I did spot Jack Miller in the Co-op one day visiting with a man I didn’t know. 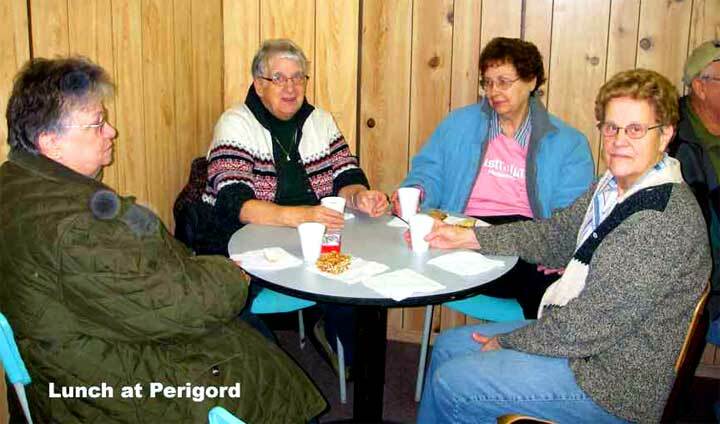 I invited myself to sit down at their table and soon met Ingi Bjornson, formerly of Foam Lake. We had lots of mutual acquaintances to talk about. Jack and Ingi both live in Sierras of Erindale, just a little way west of our place. Had a nice visit, but haven’t seen them since. Last Monday, after cleaning up the place for the new owners with the help of Lilianne Russell and her friends, we headed back to Saskatoon. First, though, we went to the Cove for coffee; then we went to Perigord Rummage Sale, where we had lunch and visited with friends. 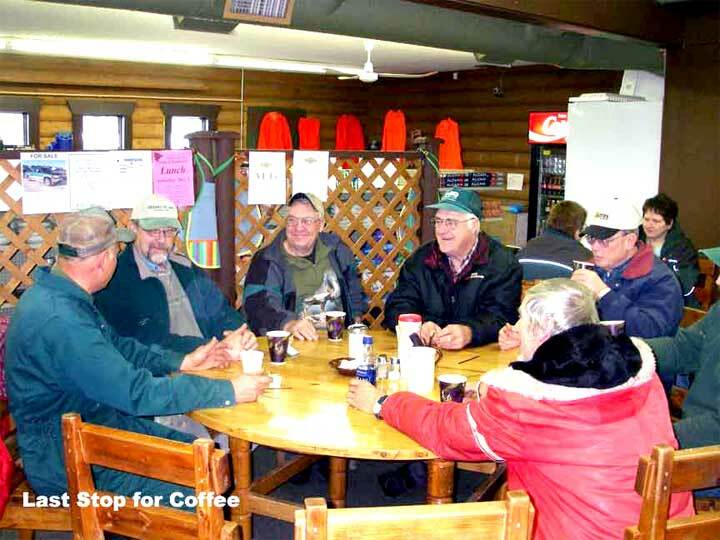 Then we took our motor home down to Grimson’s for the winter, and finally we had coffee at the Mozart Co-op with our daughter, Laurie. We eventually made it back to Saskatoon, but it took a long time.